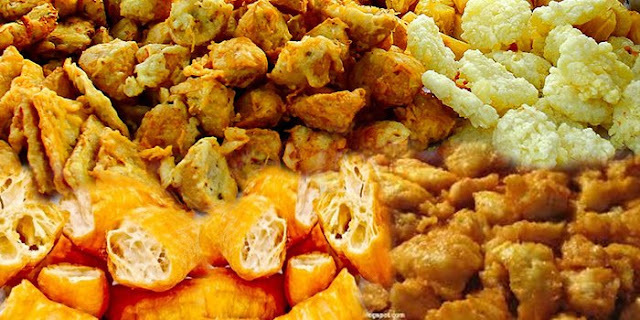 Fried foods can be found from main dishes to snacks. The savory and crunchy taste of fried foods can sometimes make the audience forget themselves, even though there is a risk behind the food. Fried foods tend to contain lots of fat, calories and salt. Because, the process of frying food can change the quality of nutrients and increase calorie content. Moreover, if the oil used for frying has been used repeatedly so that it contains trans fat. What are the risks posed? Eating large portions of fried foods is often associated with the risk of heart disease, high blood pressure, high cholesterol, and obesity. A study also mentions, the more you eat fried foods, the risk of developing diabetes 2 and heart disease tends to increase. In men, a study says that the consumption of fried foods in the long term, more than once a week, can increase the risk of prostate cancer for men. Too much fried food is also often associated with high cholesterol. The higher the level of cholesterol, the greater the risk of heart disease and vascular disease. When you consume more than your body needs, cholesterol can cause the formation of plaques that can block the flow of blood vessels, as well as blocked pipes. Complications from disturbed blood flow are strokes, atherosclerosis and heart attacks. Especially for pregnant women, excessive consumption of fried foods has its own risks. Based on research, eating fried habits before pregnancy is suspected to increase the risk of diabetes during pregnancy. Diabetes that occurs during pregnancy is called gestational diabetes. Compared to women who consume fried foods less than once per week before pregnancy, the risk for having gestational diabetes is 13 percent higher for those who consume fried foods three times per week. This risk increases with the number of fried foods consumed per week. To reduce the risk of bad consumption of fried foods, the best way to do this is to replace trans oil or oil that has undergone hydrogenation with healthier types of oils such as olive oil, canola, corn, sunflower seeds and sesame oil. In order for oil not to absorb into fried foods, it is recommended to fry food at temperatures of 176-1900C. If the frying temperature is below that temperature, the oil can seep into the food. Conversely, if the temperature is too high, the food will become too dry and the oil can also be oxidized. The other way to minimize the process of frying food is to bake food using the oven. Before grilling meat, apply olive oil, so that the meat will become crisper when consumed. No less important in minimizing the adverse effects of fried foods is to avoid using oil repeatedly. Preferably, oil is only used once in frying. In order for foods that have been fried not too oily, it is also recommended to use paper towels so that excess oil can be absorbed. If you want to eat fried foods, you should make it at home, rather than buying it. Fried at home tends to be healthier because you can wisely choose oil and how to fry it.